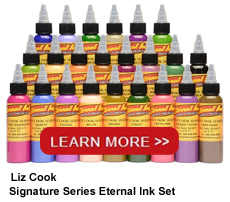 Liz Cook has established herself as a leading tattoo artist through her amazing work. Her color application is inspiring with heavy saturation and dynamic color contrasts. Cook deftly mixes realism with rendered illustrative elements to bring deeper meaning to her imagery. Even as a child, Cook knew her future would involve the arts. She earned a BFA in studio painting and drawing giving her the formal training to build upon in the tattoo studio. Cook has an intuitive understanding of portraiture which allows her the creative freedom to push boundaries without compromising realism. Much of my art has revolved around portraits, pin-ups and realism … they just ‘make sense’ in my head.